Volume 1, Number 4 of the first independent student newspaper on the CSUSM campus. In this issue, a report on The Times Advocate offer to donate a state-of-the-art newsroom, establish an internship program, and the prospect of a printing alliance with the university. 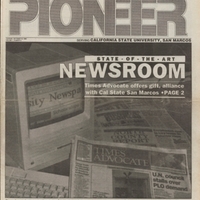 October 16, 1990,” University Archives at the CSUSM Library, accessed April 18, 2019, https://archives.csusm.edu/student-newspapers/record/10.